UPDATED 09/11/2017 with something new! I was delaying changing out the positive terminal, due to all the aux wiring and everything. 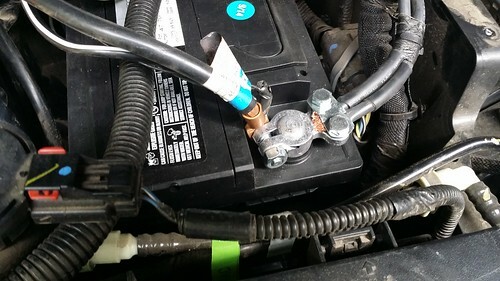 I found a set of “Battery Terminal Shims” at my local auto parts store, and they work awesome! Just remove the stock terminal ring, slide on the shim, and use a mallet to gently tap the ring back over the new shim. No gap, no movement! UPDATED 10/8/2014 with a very important update! Even though I applied this fix to my battery terminals, there must have been a very tiny gap that remained between my terminal and the battery post. 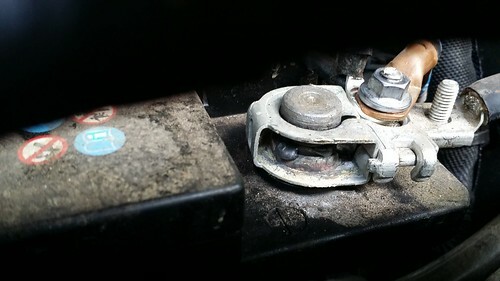 On a recent offroading trip, I was winching another vehicle and the additional strain on the battery caused a spark to arc and actually fused the terminal to the battery, causing battery failure. The ground winch cable was too hot to touch. I was lucky to get out under power and make it home. It remains an expensive fix (the OEM battery was only a year old) but if you are stuck in the woods, the costs and risks increase. Based on the temperatures, I would not rule out a fire risk. Please REPLACE your terminals immediately to prevent you from getting stuck, or worse. Battery post with molten lead, fused terminal. New battery, new terminals. I do plan on upgrading the terminals. These are temporary. The forums are ablaze with questions around concerned Jeep drivers, that their gauge cluster will suddenly light up, chime, and do some weird things – but only for a second or two. I found myself dealing with this exact same problem in both my 2012 and 2013 Rubicons (the videos above are mine). Taking the 2013 in under warranty, the dealer was just as perplexed as I was. Eventually they changed the electronic sway bar disconnect motor (claiming it was not sealed for water and thus causing the short).